Looking for a cracking Canon EOS 800D camera deal? Search no more. This is the perfect time of year to grab a bargain – and you'll find today's cheapest Canon ESO 800D prices below. Canon has always been great at making feature-packed, entry-level DSLRs and the EOS 800D keeps up this tradition. Built around a 24.2MP APS-C sensor that’s paired with Canon’s latest DIGIC 7 processor, the camera can capture images that can be printed up to A3 size and beyond, together with Full HD videos at up to 60p. The autofocus system features 45 AF points, every single one of which being a cross-type point for extra sensitivity. 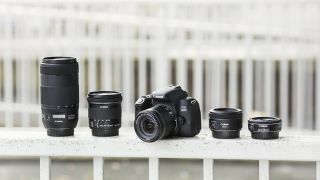 Compare this with the 39-point AF system of its closest rival, namely the Nikon D5600, which only has nine cross-type points, and you can see that Canon easily runs ahead. As if that's not enough, the company has partnered this with its clever Dual Pixel CMOS AF too, which comes into play when using live view and when shooting videos, moving focus smoothly but swiftly between subjects. A continuous shooting rate of 6fps is decent for a DSLR of this style, but if speed is essential to you, there are more affordable CSCs that can fire twice as fast as the EOS 800D, which you may want to consider. The 800D’s movie mode specifications offer plenty for those photographers looking to take their first steps into video. While there’s no 4K option, the EOS 800D can capture Full HD footage at up to 60p, which allows you to create more dramatic slow-motion sequences. There’s an electronic stabilisation mode that you can use when recording video, plus a port for an external mic, which lets you capture enhanced audio. There's no headphone port, however, which means you won’t be able to properly monitor the audio straight from camera. Of course, if you're not using this for professional-level video, this isn't a deal breaker. Other features include built-in Wi-Fi, NFC and Bluetooth, which let you pair the camera with a smart device and quickly transfer images, while the 3in touch-sensitive LCD has a Vari-angle design – great for selfies and vloggers. Like many entry-level cameras, the EOS 800D doesn't quite stretch to offering weather sealing, but the battery is a strong point, with its 600 shots per charge meaning you should be good for a whole day's shooting.